attractive aliens or just plain weeds ? aren't the issue here - they are invasive and crowd out the local native plants. 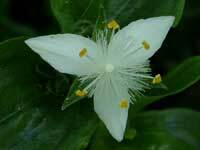 Several are Weeds of National Significance, and they all diminish our rich flora diversity. Reference to these plants can be found on PlantNet and Weeds in Australia. There are several city view lookouts in the Park. The one pictured here is in Thornleigh. Another is at the end of the Pennant Hills Fire Trail before it descends to the Lane Cover River. The Thornleigh City View Lookout is accessed from Thornleigh Oval. Go straight ahead from the turn-off to the Lorna Pass Walking Track (see Acacias webpage) and follow the signs. The walk is reasonably flat heath with an amazing display of wildflowers in spring. Declared a noxious weed by many Sydney Councils, Balloon Vine's massive entangling vines smother other plants by blocking out the sunlight. 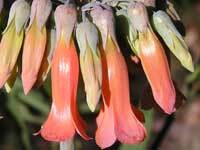 Its name comes from its seed pod (fruit) which looks like a paper balloon, and produces. It is highly invasive. 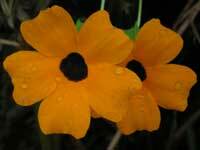 Black-eyed Susan is not on the weeds register and is used in gardens where quick cover is required. 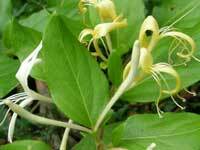 This reference gives a "home-town" aspect to this perennial creeper. One of the more attractive weeds, Blue Pigroot is a member of the Iris family. More of an attractive alien than an invasive weed. Bridal Creeper is one the 32 Weeds of National Significance. 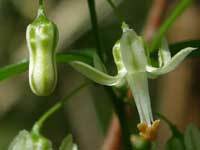 A detailed description can be found on the Weeds in Australia database. 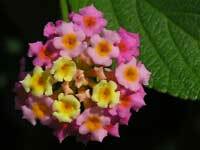 Lantana is another of the 32 Weeds of National Significance. Native of South Africa and Madagascar. Mother of Millions was a runner-up in assessing the twenty Weeds of National Significance and is a declared a noxious weed. 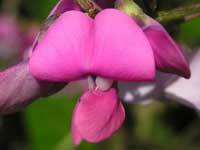 A climbing pea, that could easily be mistaken for a native. A description can be found on the Queensland Government's Weeds of Australia website. Found in many gardens, this attractive alien is a known escapee. 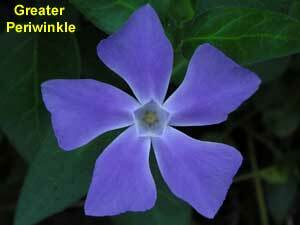 Also known as Blue Periwinkle, a full description can be found in the Weeds Australia database. 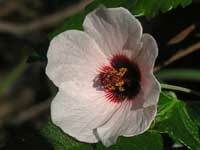 A member of the Malvaceae Family that also includes Hibiscus and Cotton. The characteristic leaves identify this small shrub when it is not in flower. 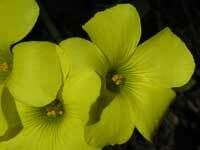 Soursob, also known as Bermuda Buttercup, occurs in all states and territories of Australia. A full description is provided here. Declared a noxious weed by several Sydney Councils, this leggy shrub can be over 3 metres high. The Senna genus was previously included in the Cassia genus - this plant was called Cassia coluteoides. 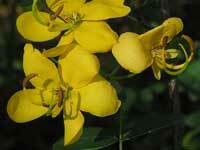 This is why it is sometimes referred to as a Cassia. Native of Central and South America. Declared a noxious weed by many NSW Councils, this member of the Daisy Family (Asteraceae) grows rapidly next to sheltered creeks and waterways. 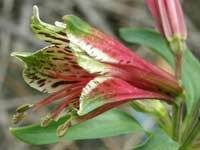 The Alstroemeria genus is commonly called the Peruvian Lily - although all species come from either Brazil or Chile. 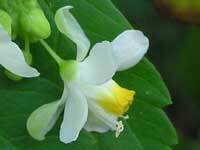 Once established, this perennial is very difficult to eradicate. This creeper was previously known as T. albiflora, and is very similar to the Australian native Scurvy Weed (Commelina cyanea). 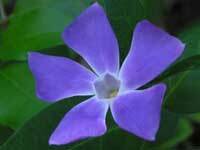 Scurvy Weed has blue flowers and pointier leaves. 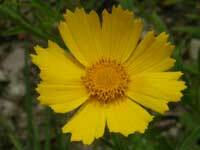 A member of the Daisy family, this annual is also known as Coreopsis and as Tickseed - due to the shape of its seed. 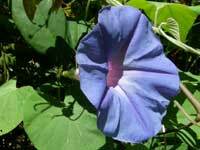 A smothering creeper, it is also known as Purple Morning Glory and Dunny Creeper. 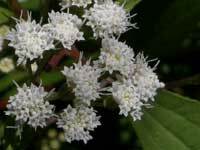 It is a declared noxious weed in over a dozen Sydney Council areas. 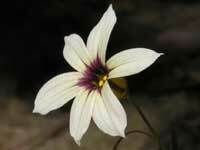 It is differentiated from I. purpurea by its longer sepals. Native of Japan, Korea & China. This hardy climber has a sweet fragrance. Its flowers bloom white and become pale orange before withering. Native of Europe & western Asia. 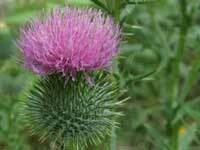 Scotland's floral emblem, a detailed description of this prickly customer can be found on the Weeds in Australia database.